Caprese Bites make an easy appetizer that’s ready in minutes. Fresh basil, mozzarella cheese, ripe tomatoes and a drizzle of balsamic glaze top toasted bread slices for the perfect bite. 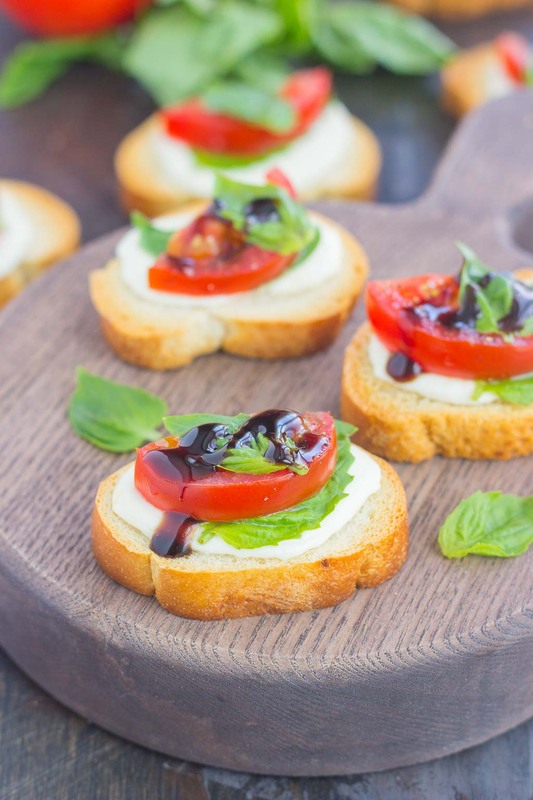 If you love caprese flavors, then this simple snack was made for you! I’m mildly obsessed with anything involving caprese ingredients. Mozzarella, basil, tomatoes….that’s just about the perfect combination in my book. Whether it’s in the form of a salad, sandwich, or bruschetta, it reminds me of summer. Panera Bread used to make a delicious caprese salad. It was only available in the summer, and whenever it came out, I promptly went there to devour the salad. I haven’t seen it at Panera for the past few years, but I always think about the delicious ingredients during the summer. Of course, other places offer caprese dishes, too. And when I’m in the mood, those dishes often appear on my plate, and are gone in a flash. So it was no surprise that I was thinking of creamy mozzarella, fresh basil, and juicy tomatoes last weekend. Summer staples, right? But instead of putting those ingredients into a salad, I went with a different option. Caprese Bites! The ingredients for these Caprese Bites are fairly simple. French bread, mozzarella cheese, fresh basil leaves, tomatoes, and olive oil. I chose to first toast the bread with a touch of olive oil before I layered the ingredients. I then added a slice of fresh mozzarella, diced tomatoes, and chopped basil leaves. Pop it in the oven for about ten minutes and voila! Caprese heaven! One bite and I was sold. The fresh basil, combined with the mozzarella and tomatoes reminded me of eating my favorite salad at Panera. 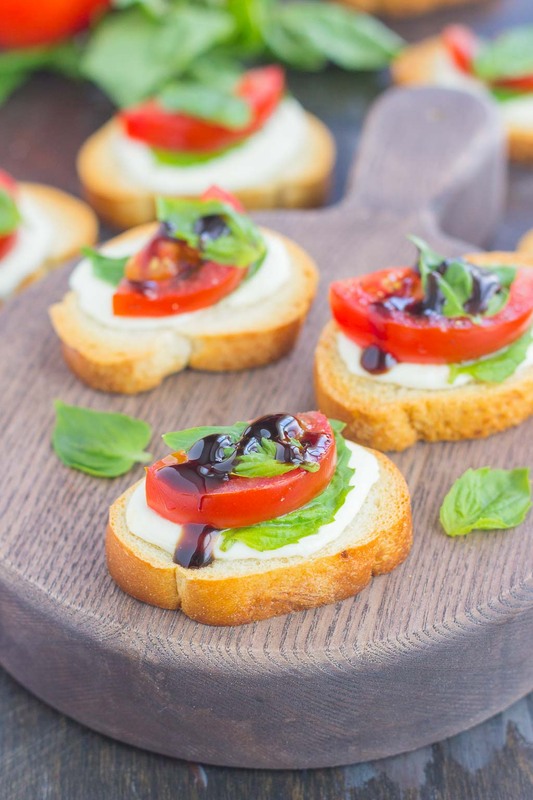 Feel free to drizzle with some balsamic vinegar for a bruschetta taste. Looking for more caprese recipes? I’ve got you covered! Caprese Bites make an easy appetizer that's ready in minutes. 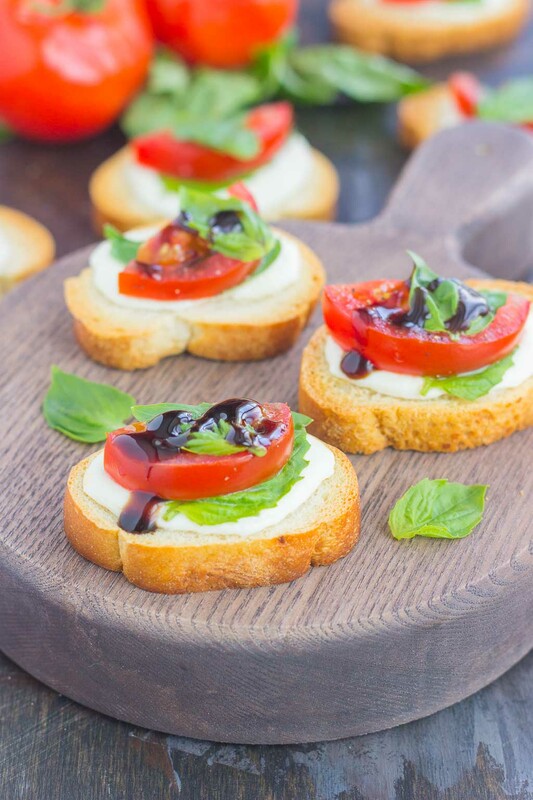 Fresh basil, mozzarella cheese, ripe tomatoes and a drizzle of balsamic glaze top toasted bread slices for the perfect bite. 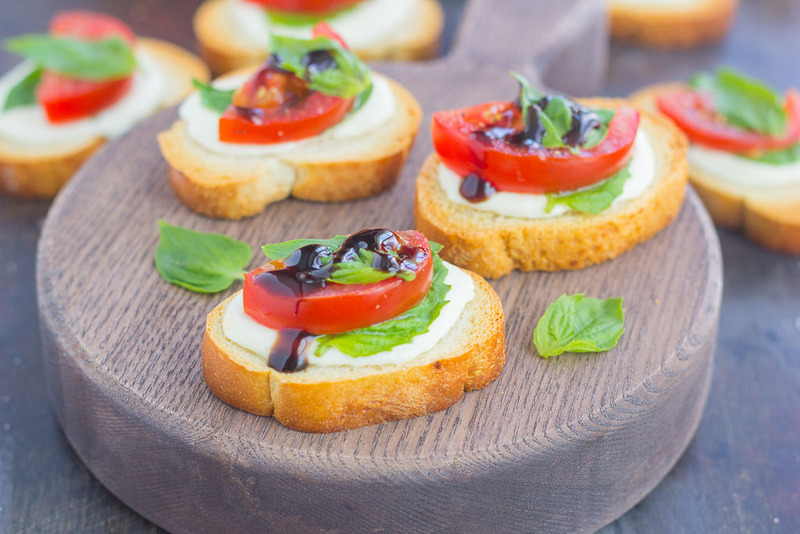 If you love caprese flavors, then this simple snack was made for you! Preheat oven to medium broil and position oven rack near top. Brush olive oil over tops of bread slices and place onto a large baking pan. Place in the oven and broil 2-3 minutes, until the tops of the bread are just starting to turn golden. Remove from oven. Set oven to 400F. Repeat with remaining ingredients until bread slices are prepared. Sprinkle salt and pepper over each baguette slice. Place into oven and bake for 8-10 minutes, or until cheese is melted. Remove from oven and let cool for 5 minutes. Drizzle with balsamic glaze, if desired. Alternatively, you can toast bread and then top with mozzarella cheese and bake until melted. Then, top with basil and tomatoes with cooking, if desired. Bites are best served immediately. Caprese bites will keep covered in the refrigerator for up to 2 days. Caprese is definitely the best in the summer, Bri! I think I could eat it all day, everyday, too! Gayle, I would eat this whole tray right now for breakfast too if it were sitting in front on me! Yum. Basil, growing that. Tomatoes. growing that. Mozzarella...? Now why can't I grow mozzarella plants? These look perfect, the cheese is just perfectly melted. Love the bread you used too. Agreed on Panera! Their mozz/basil paninis are my ultimate weakness!! Wouldn't that be amazing if mozzarella just grew on trees? I'm sure your basil and tomatoes are delicious, Laura! I plan on starting a garden next summer and those are the first two items on my list to plant. Thanks so much for the compliments! And I do like Panera's caprese panini too, I actually forgot about that! Caperese is honestly suh a genius flavor combination. These bites look amazing! The flavors just blend so well together, Medha! 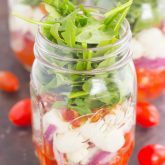 And so many different ways to incorporate caprese, too! Oooh, these look so good -- definitely a taste of summer! When the tomatoes are this fresh, I too love the simplicity of the caprese salad ingredients! Somehow they all work magically together to make some of the BEST tastes of summer! Definitely, Allison! Home-grown tomatoes are my ultimate favorite, so fresh and so many different ways to use them! what a great combo-you had me at basil and mozzarella, an awesome combo. I can imagine they would taste amazing on french bread. Great summer snack! Definitely an amazing combination! There's just something about the fresh ingredients that taste amazing on bread or in salads. I simply can't get enough of these bites this summer! Thanks, Denise! Besides being tasty, they're super easy to make, too. Nothing says summer like caprese salad! These bites look amazing! Thanks so much, Kelly! Caprese salads are my favorite too, and these bites definitely remind me of those dishes. I love all things Caprese! The hardest part would be to stop popping these bites in my mouth! I absolutely love fresh mozzarella! I don't buy it too often, but when I do, it never lasts long in my house! So combine it with some tomatoes and basil, and I'm all set! :) Happy Wednesday to you, too! I lived off caprese everything last summer but I really haven't thought of it much this year. How TERRIBLE is that?! Obviously I need to get it together. These bites are so cute. I just picked up some gf french bread, this is the perfect way to use it! I actually haven't had too many caprese dishes until about month ago, and then I was hooked for the summer! And since these bites are so easy to whip up, I know I'll be making them a few more times while the farmer's markets are still going on. They look addicting, right? I had so much trouble not eating about 10 caprese bites in one sitting, they're just that fresh and tasty. Thanks so much for stopping by! This looks so good and fresh! Man, I hate it when restaurants discontinue good dishes. It's the worst! And they replace them with stuff that's not as good. I'm glad you can recreate the flavors here! Thanks, Mir! These bites definitely remind me of Panera's delicious salad, and even better that I can make them all on my own! I am definitely obsessed with caprese anything too! These look addicting! And super easy to pull together for an impromptu summer party! Pinned! These would definitely be great for a summer party! So easy to throw together. Thanks so much for the pin, Lindsey! I'm with you, Ashley! These bites are so addicting and easy to grab 'n go! Agreed... I love caprese. Have you tried burrata cheese? I bought it one time by accident thinking it was a mozzarella ball, and it pretty much changed my life. So amazing! I've never actually heard of burrata cheese, but now I'm going to be on the lookout for it! Sounds like it's delicious! Those big chunks of mozzarella are making my mouth water seriously!! You and me both, Ami! I could eat hunks of mozzarella cheese all day, every day! Thanks, Danielle! I think I ate most of these and then had to pawn them off on my husband. Way too addicting! 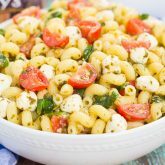 Caprese is one of my personal favs too, so I am ALL over these gorgeous bites! This looks like my dream lunch/midnight snack. ;) Can't wait to try these, Gayle! It doesn't get much better than caprese anything in the summer. These little bites are no exception - they practically scream summer and look absolutely adorable. I would devour these in no time! Thanks, Kathi! These are so perfect for the summer, especially with the fresh flavors! I love that you've turned caprese salad into a bread-y little appetizer! I could just keep popping bite after bite into my mouth! These are definitely so easy to pop and go, Kristine! So tasty, too! I am mildly obsessed with all these ingredients too. Love that you turned them into smaller bites. Yummy. Thanks, Kathy! 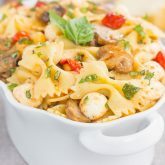 These were so easy to prepare and even better to eat! Oh, wow! I have a distinct feeling I could eat these every summer evening ... downed with a nice crisp glass of white wine. They're sort of like a very simple Italian mini pizza in a way, I suppose. In any case, they sound like a perfect little snack to me! These would definitely go perfect with a glass of wine. And yes, it could be a mini pizza too, especially with a little tomato sauce added in. Thanks, Helen! Oh WOW! These look delicious. I can see why you were obsessed with that salad! Thanks for the kind words, Julie! These bites are even better than the salad! Thanks so much, Samina! These little bites turned out delicious and fresh, I simply couldn't get enough of the flavor! 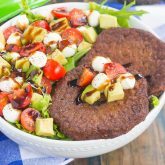 I am a sucker for anything caprese related - it is just one of the best flavour combinations and it totally reminds me of summer! Yum! Isn't it the best? So fresh and flavorful! Well you can beat this little babies. Fun appetizer for anytime of the year. But since it's summer I can see them on my patio table----easily. These bites are prefect for the summer and for entertaining. So fun and delicious to eat! I could definitely eat these bites for dinner too, Izzy! Especially in the summer, there's just something about this fresh combo that makes it extra delicious! Mini foods are so fun, Kelsey! Thanks for stopping by and for the kind words! Thanks so much for the kind words, Tash! If you try this for lunch, please let me know! I definitely agree that it would be amazing! All you have to say is caprese and I'm down! These new pictures are GORGEOUS, Gayle and I'm totally trying these cute little bites for the next family hangout! Thank you, Sarah! One of my favorite summer apps!